At Hotel Cesare Augusto, we offer our guests a very special dining experience. We choose local products, excellent fish, and pay particular attention in selecting fruit and vegetables that are in season. This allows us to put tasty and healthy dishes on your table, every day. Every day, guests can choose typical local fish dishes as well as national and international cuisine. 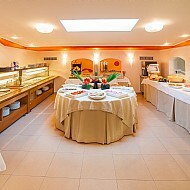 The abundant vegetable and antipasti buffet will complete the meal. Desserts are skilfully prepared by our chefs, who provide the finishing touches for every lunch and dinner. Do you have any food intolerances? Are you vegetarian? No problem! Our kitchen staff will also be able to offer you excellent dishes that respect your specific requirements. Savour your holiday in Bibione at Hotel Cesare Augusto!